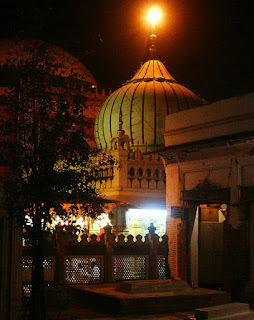 Khwaja Nizamuddin Aulia, Allah's bless his soul, believed that if man learnt to live for the Lord alone, there would be all love, peace and amity in this world. And the very basis of human relationship would change. Human beings are ‘like children of the God on earth’ and one who seeks His pleasure must strive for the welfare of all people, regardless of any consideration. ‘Living for the Lord alone’ meant a total transformation of human psychology problems. Inspired by this ideal whatever a man did or applied would became devotion to God. It lead to sublimation of motivations in life. Love to Allah-Taala is the destination of success. Romance is the road of this righteous path. The captain of the ship is no other but His Grace, Oh! Traveler tie up your belongings. Board in it and sail in the Ocean. The spiritual Sheikh believed that one who caused pain to any human heart could not attain spiritual excellence. He cited Sheikh Abu Sai’d Abul Khair’s remark that though there were innumerable ways leading to him but bringing happinessto human heart was surest way to gnosis. Devotion to Allah (God) is of two types jazmi (intransitive) and muta’addi (transitive). In jazmi devotion the benefit which accrues is confined to the devotee alone. This type of devotion includes prayers, fasting, pilgrimage to mecca, recitation of religious formulae, turning over the beads of the rosary etc. The muta’ addi devotion, on the contrary, brings advantage and comfort to others. It is performed by spending money on others, showing affection to people and buy others mean through which a man strives to help his fellow human beings. The reward of mutta’addi devotion is endless and limitless. Divine bounty does not discriminate between one individual and another. When the sun rises, it gives light and warmth to all people whether living in palaces or in huts. When it rained, the poor and rich alike are benefitted from it. Once, sheikh Mu’inuddin Chishti of Ajmer was asked to explain the highest form of religious devotion which endeared man to God. He said: “Develop river-like generosity, sun like bounty and earth like hospitality”. His holiness thought that there are three types of persons so far as involvement in material pursuits was concerned. “First, those who want worldly goods and spend their days in its search… Secondly, those who consider the world to be their enemy and disdainfully about it. Thirdly, those who consider the world neither an enemy nor a friend and do not refer ti it either with enmity or friendship. They are the best of all”. The Sheikh believed in following the last course, free from all unnecessary inner struggles and tensions. If one man vents his wrath on another and the second man is patient , the virtuous attitude belongs to him who is patient and not to him who gives vent to him wrath. The Sheikh used to say that recitation of Quran was more effective in achieving gnosis than zikr (recital of Holy Names of God). Dhikr, he said, made spiritual progress quicker but there was always a risk of decline in progress thus achieved. Spiritual progress achieved through the recitation of Quran was free from all such risks of decline. He used that Quran contained specific instructions; prayer and litanies (wazifa, additional invocations and dua) for the common run of believers; spiritual perception and sensation of divine grace (Lata’if) for the aulia and truthful maxims (haqa’iq) for the prophet. He advised his disciples to read the Quran in such a way that majesty of God illumined their hearts. The Sheikh advised his disciples to develop complete trust in God (tawakkul) and remain resigned to His will as it helped man in breaking the trammels of society and lead a life which one cam call his own. Miracle-mongering had no place in the spiritual discipline of Sheikh Nizamuddin aulia (R.a). He considered performance of miracles a sign of spiritual imperfection. A spiritual mentor should not instruct his disciple openly or too directly but should use hints (using parables) and suggestions to bring about change in his thought and behavior. One who repents sincerely after committing a sin and one who committed no sin hold equal position in mystic discipline. Though God’s bounty is always there, whatever one can achieve is through the dint of his effort. Under no circumstances one can earn anything without struggle. Spiritual control and sobriety (sahu) is superior to (spiritual) intoxication (sukr). Food should be distributed to all and sundry without any discrimination. One should scrupulously abstain from the display of his spiritual achievements. Books of Mashaikh (spiritual mentors) should be regularly studied for enlightenment and culture (of spirituality). Salik (traveler) achieves greatness from four things: Less eating, Less talking, Less sleep, and less socializing. Benediction showers at three times: in the state of hearing sacred music, eating for purpose of obedience, speaking about the mendicants. Love of Auliya saint's rules over their intellect. The joys neither make a fakir happy nor suffering grieve him. Whatever you do not like to be done to yourself, do not wish it to happen to others. Wish for yourself what you wish should happen to others also. Altruistic service to others is more meritorious to the performance of obligatory prayers.